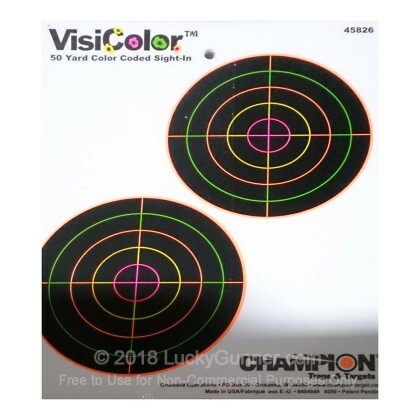 Champion's Visi-Color sight-in targets are just what you need next time you go to sight-in your hunting rifle. These targets are 5" in diameter and are bulls-eye in shape. Visi-Color targets highlight where you hit in orange, making it much easier to make adjustments without going down range every few shots. Each paper target has two off set bulls-eye targets, making them last longer, and adding some variety to your range time. If you are ready to spend more time range shooting, and less time checking your targets, then you need to get these targets by Champion!